The Diadem of the Stars (Portuguese: Diadema das Estrelas) is a Diamond Tiara originally commissioned by Queen Consort Maria Pia of Savoy, who had a love for jewelry and fashion. It is a piece of the Portuguese Crown Jewels. The diadem was made in 1863 for the Queen Consort Maria Pia of Savoy, wife of King Luís I of Portugal. The tiara was fashioned in the workshop of the Portuguese Royal Jeweler, Estêvão de Sousa, in Lisbon, Portugal. 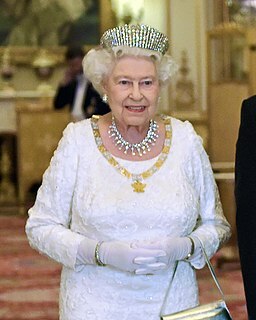 The tiara is just a piece of a whole set of jewelry that was commissioned by Maria Pia, which includes the Necklace of the Stars, the counterpart of the diadem. The Diadem of the Stars was made in the workshop of the Portuguese Royal Jeweler in Lisbon, Portugal. Commissioned in 1863, the tiara took three years before it was completed in 1866. It is fashioned out of gold, silver, and colourless and pink diamonds. Marie José of Belgium was the last Queen of Italy. Her 35-day tenure as queen consort earned her the nickname "the May Queen". A parure is a set of various items of matching jewelry, which rose to popularity in 17th-century Europe. Infante D. Afonso of Braganza, Duke of Porto was a Portuguese Infante of the House of Braganza, the son of King Dom Luis I of Portugal and his wife, Dona Maria Pia of Savoy. From 1908 to the abolition of the Portuguese Monarchy in 1910 he was the Prince Royal of Portugal as heir presumptive to his nephew, King Dom Manuel II. Princess Maria Pia of Bourbon-Parma is the eldest daughter of Umberto II of Italy and Marie-José of Belgium. She is the older sister of Princess Maria Gabriella of Savoy, Vittorio Emanuele, Prince of Naples, and Princess Maria Beatrice of Savoy. Dona Maria Pia of Savoy was a Portuguese Queen consort, spouse of King Luís I of Portugal. On the day of her baptism, Pope Pius IX, her godfather, gave her a Golden Rose. Maria Pia was married to Luís on the 6 October 1862 in Lisbon. She was the grand mistress of the Order of Saint Isabel. Maria Theresa of Austria-Este was born an Archduchess of Austria and a Princess of Modena. She was later Queen of Sardinia as consort of Victor Emmanuel I of Sardinia. In the history of Portugal, a Miguelist was a supporter of the legitimacy of the king Miguel I of Portugal. The name is also given to those who supported absolutism as form of government, in opposition to the liberals who intended the establishment of a constitutional regime in Portugal. The Crown of João VI, also known as the Portuguese Royal Crown is the most recent and only extant crown of the Portuguese Crown Jewels. Princess Amélie of Orléans was the last Queen consort of Portugal. Wife of Carlos I of Portugal, she was known to her husband's subjects as "Maria Amélia de Orleães". As the eldest daughter of Prince Philippe, Count of Paris, and his wife, Princess Marie Isabelle d'Orléans, she was a "Princess of Orléans" by birth. The Pantheon of the House of Braganza, located in the Monastery of São Vicente de Fora in Lisbon, Portugal, is the final resting place for many of the members of the House of Braganza, including Portuguese monarchs, Infantes of Portugal and other members or associates of the Braganzas, as well as other notable royals and nobles not belonging to the house. The Emperors of Brazil were originally also interred here, but their remains and those of family members were transferred to Brazil. The Necklace of the Stars is a diamond necklace originally made for Queen Consort Maria Pia of Savoy. It is a piece of the Portuguese Crown Jewels.